The PR080-52 is a compact-size chemical store specifically designed for safely storing smaller quantities of Class 5.2 Organic Peroxides outdoors (up to 80 litres) . This fully relocatable safety cabinet is easily moved using in-built forklift channels and then bolted into place. Features of the PR080-52 include: a single heavy duty door that opens out a full 270°, high security ISO locking bar, perforated shelving with a compliant spill containment sump. The unit can withstand a tough outdoor environment and is finished with high-tech polyurethane coating. The PR080-52 is another compact Dangerous Goods store from STOREMASTA’s Mini-Series, a range of pragmatic chemical stores — for storing smaller quantities of Dangerous Goods outside. 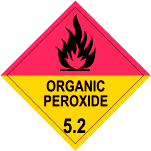 Order your organic peroxide store from STOREMASTA today, it’s proudly Australian made.